Home » SERP Change » Google Panda #25: Affect On SERP's After Panda Update. Google Panda #25: Affect On SERP's After Panda Update. There are two algorithms which affect the SERPs which is Jolts and Jerks. These two behaviours are so impactful in search engine. Which define the search algorithms has refreshed poorly but it’s very painful when you look after your top keywords are disappeared from search engines. I have researched that every 10th date of every three month, Google refresh it’s algorithms and after few days’ company verifies that actually there was a Panda or Penguin update. The chatter has been begun at this WebmasterWorld thread about this spices subject. I saw a huge change of my client top order keywords which is not available in top 100 ranking. 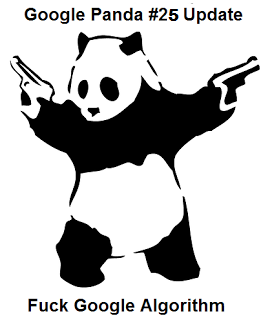 If, Matt Cutts verifies that it was a Google Panda # 25 update, so what will be your answer? For me, this is same old days, let’s prayer for the best and wait for the Press Release for this Google update.